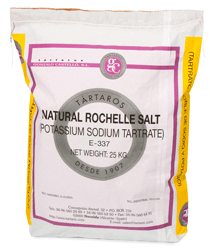 Rochelle salt, also known as POTASSIUM SODIUM TARTRATE, is a white crystalline powder or colourless crystal, which is obtained by treating the natural raw tartaric material. Our Rochelle Salt is manufactured in a completely automatic unit plant. From this optimum automation, we are able to control every step at the production process and guarantee a natural product of high quality, which conforms to the latest requirements of the international pharmacopoeias. 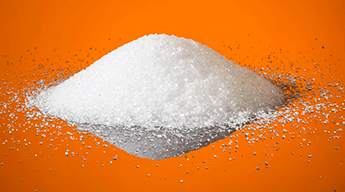 Because of its widely diversified applications, we offer the product in colorless crystals and also in white crystalline powder. Rochelle salt is included in the list of FOOD ADDITIVES under code E-337. Solubility in water: 73 g. Sal de Rochelle/100g of water at 20ºC. Practically insoluble in alcohol. Principal impurities: Conforms with the limits established in the most recent editions of the FCC, BP, USP, and NF.